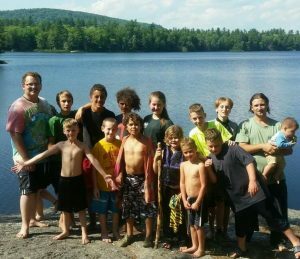 Maine day camp to teach wilderness skills and appreciation. 2016 campers after Badge Ceremony at Ellis Pond in Brooks, Maine. Camp Forest understands that many young people today struggle with feelings of frustration, anxiety and depression due to the stress of modern life and the challenges they face. Often times, the struggle leads to feeling out of control and afraid. Unfortunately as a result, a growing number of families turn to medication for common behavior issues and in some cases, teens experiment with drugs and alcohol as an escape from the problems of life. The sincere empathy, understanding and love exemplified by Camp Forest staff helps campers embrace life with confidence. As a result, young people learn to face challenges as opportunities to grow and to develop a level of maturity and healthy ambition. Camp Forest integrates outdoor living skills for a productive journey through adolescence. Campers experience joy connecting with earth, water, and sky as well as with others, helping them to explore new horizons. Campers grow their skills, talents and dreams with the ability to make healthy choices and increasing an appreciation for the good things in their lives. The healing and nurturing program of Camp Forest in a natural environment helps children reach their full potential in a personal journey with nature. It is a pleasure to connect with dozens of youth each summer and support their creativity and imagination while exploring the beauty of Maine, learning wilderness skill sets, and being recognized in badge ceremonies while making new friends. Make a Donation – your donation can help a child attend camp or help us purchase needed items for Camp.